This post was written for Daily Hive by Elizabeth Emery, follow along her plant-based adventures on Vancouver with Love. Looking for dairy-free gelato? Meat-free burgers? Vegan bennies? Going plant-based is more popular than ever and there’s no shortage of offerings in this city. Whether you want to tickle your taste buds with chorizo pizza, deep-fried artichoke sandwiches, vibrant salad bowls, or go fine dining, there’s a vegan option for everyone. You might be surprised know that there are a good number of plant-based offerings north of the Burrard Inlet. For your post-activity cravings – or just healthy grub cravings in general – here are the best vegan restaurants in North Vancouver. Buddha-full has been around for several years at its West 1st Street location but recently opened another branch on Dollarton Highway. Both venues are light and airy with a trendy vibe, and serve fresh, colourful food that you’ll want to come back for. In particular, the avocado toast and Buddha bowls are excellent. Raw food can frequently be hit or miss, but Tao Organics do it brilliantly at their mostly-raw café. They recently moved to Esplanade West, where they serve up delicious raw dishes such as crepes, wraps, sandwiches, and cheesecakes. Unusual for most raw food options, there really isn’t a bad item on the menu and everything is absolutely bursting with flavour. The latest branch of the classic W 12th hipster brunch spot, this Ambleside restaurant is just as good as its sister. This lighter, more modern restaurant features a very similar menu, and fortunately also offers the famous weekday brunch menu! The Heirloom Hash and Heirloom Burger are the dishes to try. With mimosas, of course. With a Japanese-focused menu, this North Vancouver staple offers a café as well as a market selling fresh, frozen and ready-to-go salads. Very focused on the high quality of their products and dishes, must-try menu items are the delicious Spicy Tan Tan Ramen and the Kyoto Style Udon. You might have heard of Green Moustache already. With several locations in Whistler and Squamish, as well as their own vending machine (which seems quite the feat), they offer incredibly fresh, nutrient-dense cuisines such as Raw Pad Thai and Buddha Bowls. That said, they also have luxuriously decadent (but still healthy) desserts. Try the Chocolate Avocado Tart and the Caramel Date Square. You won’t be sorry. Glory Juice is a staple in the city. 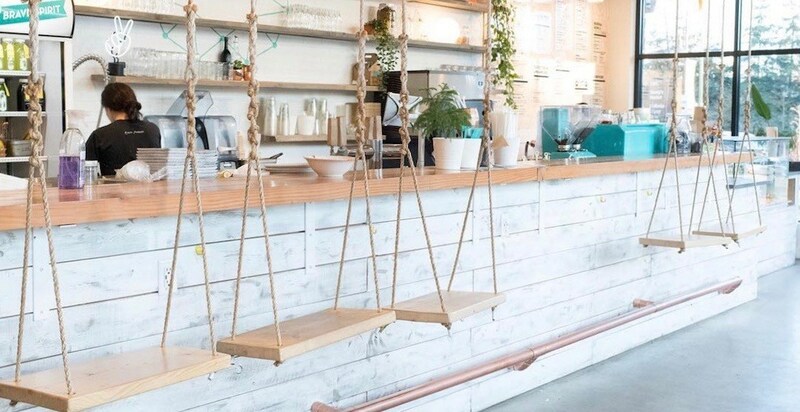 With multiple locations, this is their first in North Vancouver, and you’ll find it stocked with (obviously) cold-pressed juices, as well as a full menu of nutritious food. Completely vegan aside from bee products in some items, favourite menu items include the Breakfast Toast (with nut butter, banana, and cinnamon) and the Warm & Hearty Bowl (quinoa, lentils, soup and massaged kale). For any coffee-lovers out there, Wild Trails is the place for you. The owners make all their syrups in-house from organic ingredients and are passionate about providing vegan, chemical-free food and drink to fuel you on your hike. Their small food menu includes wraps and muffins, and they also sell To Die For’s famous banana bread. The only non-vegan/vegetarian restaurant on this list, Bluhouse Market and Café deserves a mention due to its extensive vegan menu options and for the fact that it stocks items from local vegan producers such as Blue Heron Cheese and Say Hello Sweets. Their range of crepes with vegan-options is incredible, particularly the Forage (mushrooms, pesto, and tomatoes), and you’ll find it difficult to resist their huge selection of freshly-baked vegan-friendly muffins and cookies.